There are approximately 800 restaurants in New York that are “Asian influenced.” There are probably another 400 that serve some take on pork belly, and let’s say there are 200 serving some newfangled “fancy” take on deviled eggs. And at least a dozen are run by chefs who trained at places like Eleven Madison Park. Tuome is located in a cozy little space on 5th Street near Avenue B, and it’s one of the most enjoyable new places we’ve been recently. 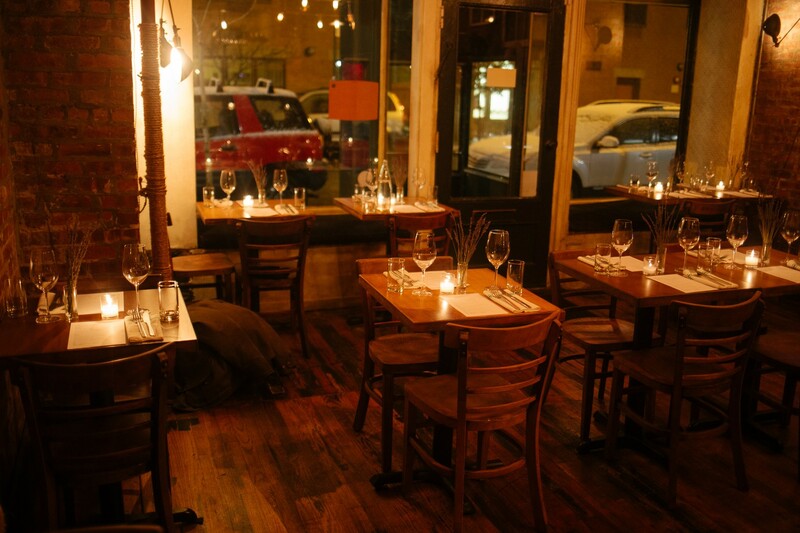 The food and space both have that rare ability to feel casual and comfortable, but still finished. Tuome isn’t a half-finished assignment cobbled together during a Red Bull-fueled all-nighter. This place did the homework all semester and even got one of those plastic folders to put the term paper in. A number of menu items - pork belly, octopus, scallops, skate, mushrooms - are not uncommon, but their preparations all are, in great ways. Octopus comes in a cool spiral with XO sauce, the scallops have a somehow not ridiculously rich foie gras sauce, and mushrooms feature an exploding egg yolk. The star of the show, at least in that it was on nearly every table, is the “Pig Out” for two, which consists of little squares of crispy pork belly with sides of spicy sesame noodles. The service is solid and friendly, which helps, considering the crowd here was slightly older than average for the East Village. We’ve seen quite a few dates on our visits, but we’d come with a group of four or more if you can so that you can order the large format “Pig Out” while still getting to try the rest of the menu. Speaking of which: Let’s. Get. Into. It. Deviled eggs are a “thing” now, and not just at your aunt’s Easter party. This one’s crispy on the outside with chili on top. The octopus comes in one long, nicely-cooked piece, with a creamy XO sauce in the middle of the plate. We’ve been thinking about this dish since we tried it. Chicken liver mousse alone on the soft toast would be good - with the sweet maple syrup, sea salt, and pumpkin seeds, it becomes awesome. A must. A pretty funky selection of mushrooms, with an exploding egg yolk. This fish is lightly fried, but it’s no fish and chips. It’s topped with little bits of almond and cauliflower, as well as a foamy sauce. If you’re with a group of four, we’d do an order of this plus the Pig Out. If you love scallops, go for it. These were enjoyable, but not as memorable as other dishes. This is Tuome’s big hit so far, and for good reason. For $49, you get 10 blocks of exceptionally crispy pork belly, plus a salad with persimmons and two bowls of al dente spicy peanut noodles. That’s a lot. It’s also a pretty rich choice for date night, and you won’t have room to order much else, so come with a crew and get one for the table. Or just come back on repeat visits. Also, Chinese delivery places - please figure out how to make sesame noodles like these. If you’re not doing the Pig Out, this is a good choice should you want a side carbohydrate. The glutinous rice comes with little bits of Chinese sausage and duck fat. And a few pieces of kale. For good measure.